VI. How science was (also) conducted in the 90’s | Frozen Evolution. Or, that’s not the way it is, Mr. Darwin. A Farewell to Selfish Gene. So what was my research team actually like? Probably like most of the teams forming in our university in the 90’s. It’s reminiscent of a passage from Šimek and Grossmann‘s A visit to the circus: “The orchestra may not have been the most numerous, but both of the musicians, the accordionist and the conductor, did what they could.” As was practically a rule in our departments at that time, the majority of the studies were carried out by my own efforts and those of undergraduate students. When the first generation of undergrads “grew up,” some of them went on with graduate studies – only then could they systematically devote themselves to independent research. Until then, the majority of their time was taken up by lectures and training, but, unlike today, almost none of them had a job during the course of the year. They likely got money for their studies and vacations abroad from their parents, from summer jobs and from merit-based scholarships. At first I hunted down experimental subjects on my own; I went around the biological departments, trying to convince students and my colleagues, both those I knew and didn’t know, to participate in the study. Testing for toxoplasmosis was conducted by Jaroslav Kulda, and if he wasn’t available, then Ivan Hrdý, one of his graduate students, filled in. Hrdý I convinced to continue the testing even after we stopped receiving patients. That was around the year 1993. I don’t know why testing stopped; I suspect it was because of the recent interest of medical laboratories to test patients themselves, because it held a financial interest for them. Then there hung over our head the threat that someone would complain of being tested by a someone who is not a qualified medical person. A somewhat laughable state of affairs – whereas a nurse fresh out of high school is acceptable, a professor of parasitology with over thirty years of work experience poses a problem. This state of affairs – that only a physician, and not a biologist, can give people injections – is the successful result of physicians‘ efforts to monopolize through bureaucratic means a certain part of the scientific field. In reality, a biologist with a long-time experience will certainly manage an injection better than a freshly graduated nurse. That it’s not, in fact, a matter of protecting a patient against untrained incompetent biologists, but merely an effort to achieve a monopoly, is apparent in that phytopathologists, “plant physicians,” are purportedly attempting the same. With their efforts, the phytopathologists have shown the physicians’ true colors, and if they also succeed, it will be clear to any discerning person that similar practices aren’t in the interest of the patient, but are about a certain guild’s display of power, by which it ensures itself a monopoly. Oftentimes I’ve told myself that it’d be nice to push into some law the provision, that any experiments with live organisms can only be provided by the graduate of a college of natural sciences. Then I’d be interested in a lawyer’s arguments on whether some medical studies aren’t illegal, because their research team lacked a natural scientist-biologist, permitted to work with, let’s say, sea urchins (or with primates of the genus Homo). Fig. 17 A bar graph demonstrating the difference in reaction time between Toxoplasma-infected (shaded bars) and uninfected (unshaded bars) mice. Six weeks after infection, mice jump off the warm platform substantially later than uninfected mice. Three months after infection, there is less of a difference; the infected mice even jump off sooner than the control animals. But it is important to realize that few mice survive three months in nature, therefore the situation so long after infection is not relevant to Toxoplasma’s chances of transferring to a cat. The graphs show means with standard errors. Probably the most interesting discovery regarding the effect of latent toxoplasmosis on the behavior of animals was achieved by our British competitors in the laboratory of Joanne P. Webster. If you google “fatal attraction” and Toxoplasma, then the search engine won’t come up with the new release of the famous thriller, but many links to the research of this British team. In the year 2000 they were able to describe that brown rats with latent toxoplasmosis no longer avoid places rank with the smell of cat urine, but, to the contrary, seek them out (19). Neurophysiologists from Stanford University later showed that this is a highly specific phenomenon (20) (21). Infected brown rats (and mice) have an unimpaired sense of smell and avoid other dangerous stimuli; but the scent of cat truly attracts them. This study, which even I was initially skeptical of, has been repeated many times, in at least three different laboratories. So the described phenomenon is most likely real. It is, however, quite difficult to imagine how Toxoplasma can affect the nervous system of its host so specifically, that the switch from repulsive to attractive occurs only with the scent of cat. So how do we Prague scientists plan to beat them? It’s probably better that I keep it to myself. Otherwise, our students might realize the identity of these samples, whose odor they’ve been evaluating for our experiments for last two years. several simple ethological methods. Among them were definitely the hot plate and the so-called open arena. In the latter test a mouse is thrown into a meter by meter arena with a square grid drawn on the floor, and one follows how many squares the mouse visits during the course of ten minutes, how often it perches on its hind legs and looks around, and so on. This method actually follows the animal’s spontaneous action. If I remember correctly, Jan Votýpka wasn’t involved in the studies on humans, but only in those on animals. A while later Jan Havlíček, who conversely devoted himself exclusively to studies on humans, joined my laboratory; he didn’t, however, test our students, but blood donors in the nearby blood donation center. His primary object of interest was the reaction times of these persons. Initially, I think that the questionnaire studies – whether those applied to the first batch of students, to the former patients with acute toxoplasmosis or to pregnant women – were primarily carried out by me. I remember very well, copying from the barely legible index-card files in the Center for Disease Control and Prevention the necessary data regarding the former patient. A brief digression – it was good that I did so, because in the year 2002 the flood swept out the center, and the filing cabinet with this valuable data was mostly destroyed. It was fortunate that at the last minute I extracted something beneficial for science from this gathered data. When conducting the second study on women, former patients with acute toxoplasmosis, I had already obtained a research grant and could afford to pay the laboratory technicians in the Center for Disease Control and Prevention to enter the data from the filing cabinet into the computer for me. Nevertheless, completed questionnaires continued to come to our department, and I or my students had to transfer this data into the computer by hand. I usually fulfilled such mechanical work at home, watching TV while pounding away at the keyboard of a primitive PP-06 computer. I made myself a nifty program which checked for specific types of mistakes made when I entered in the answers. At the time I also used this program in the department for testing students. Unlike the paper questionnaire, this program not only made filling out the questionnaire about thirty percent faster, but also immensely simplified processing the test results – it wasn't necessary to transfer the data from paper to computer, nor was it necessary to manually convert raw data using tables into age-standardized values. But the program additionally recorded how long it took the test subject to select an answer for individual questions. I expected that toxo-positive persons would answer some types of questions more slowly than toxo-negative persons – though the answer might not differ. Yet I never got to actually processing the data regarding the time to complete the questionnaire. It's one of the many arrears tucked away in my desk drawer, or rather somewhere on the hard drive of my computer. From my experience, I've realized that when research really takes off, results pile up much faster than it is possible to continually process them – and, above all, faster than it is possible to publish the processed results (Box 32 How and why a scientific publication is born). Officially, scientific publications ensue from research projects. A researcher writes a project, whose purpose is to answer a certain scientifically interesting question. If he succeeds with his project in the grant competition and obtains financial resources, he'll implement the planned studies and glean an answer to the questions he laid. He subsequently publishes this answer as a scientific article in a journal, so that the results of his study might be shared with as much of the scientific public as possible. I don't insist that my experiences are universally applicable, but, on the other hand, it doesn't seem to me likely that they would differ dramatically from the experiences of my colleagues. What I am sure about, however, is that my experiences and the official process of scientific publication are like night and day. Most of the results that we finally published were obtained as the by-product of other studies. Even when the results were directly related to the project from which they arose, they were most likely obtained long before the respective project was proposed for a grant. For only a completely irresponsible person submits to the grant competition a project that's not at least half-way done. A careful person, like I, generally enters a project at least 80% complete (and for the duration of his proposal's evaluation, crosses his fingers that the publications not come into the press before he is given the grant). But the institution giving money for an already completed project is not defrauded – the funds are used for another project, usually a follow-up, which becomes the subject of the next grant proposal. Publications don't usually come about so that other researchers in the field can use them, but in spite of the fact that other researchers can use them. Other researchers in the field are first and foremost competitors, and the ground must be cut from under their feet – i.e. they must be overtaken in solving questions. Yes, overtaking them usually means publishing a discovery before they do, but only a small percentage of articles actually publish a discovery – most of them show how it is and isn't possible to achieve that discovery in the future. Many publications come about so that a researcher can display a scientific feat to the grant agency and thus heighten his chances of later obtaining another grant. Many publications come about because a certain number of one's own publications are required of an applicant for a scientific or teaching degree or position (a PhD, associate professor or professor). But most publications arise from vanity. Like a gunfighter notches his pistol, a researcher collects his publications, delighting late at night in how his list is steadily growing. Yet today this proclaimed honorable competition, which in many cases resembles the manner of amateur sport until the 50s, is critically endangered by commercialization (but then again, what isn't?). The taxpayer began to care about what he's getting for the billions that go to science, and an educated taxpayer even begins to wonder whether he's getting the same number of publications for his taxes, as is a taxpayer in the U.S. or Great Britain (which he likely won’t get any time soon). So the respective government agencies don't waste time in motivating their researchers to the highest production of scientific articles in top journals. The number of articles is strictly observed, and based on their number and the ranking of the journals in which they were published, the respective scientific institutions and sometimes even teams are financed (see also Box 28 How to measure quality of science). In some countries this effort of the government bodies is carried out to an extreme. For example, in China, publishing an article in a prestigious journal brings the team and specifically the researcher such a great financial award, that researchers there are supposedly willing to pay foreign teams a more than decent sum for being added to the list of authors on their publication. Fig. 18 The Toxo-team, in its strongest lineup to-date (2003). From the left: Jitka Hanušová-Lindová, Petra Kolbeková, Martina Vitáková-Novotná, Mirka Pečálková-Berenreiterová, Jaroslav Flegr, Jan Havlíček, Šárka Kaňková, Romana Vavřinová-Křivohlavá, Anna Skallová-Fialová, Hana Hodková-Šturcová. As I already mentioned, the entire time I actually led two teams, which ceaselessly produced more and more data. For one, I led a team studying manipulation hypothesis, whether it be on humans or on animals (Fig. 18), and then I led a team studying the molecular phylogenetics of parasitic protozoa. In addition I collaborated closely with a team studying human ethology in the Faculty of Humanities, led by my former undergraduate and graduate student Jan Havlíček (see Box 33 How engaged women sniff out good genes). Only the students researched on animals, whereas both I and the students did so on people. I must confess that the studies on humans interested me more, but a number of my undergrad students who began researching in the department and eventually even in my laboratory were interested in working with animals, and not in convincing students or blood donors to participate in experiments, sending out questionnaires or transferring data from questionnaires into the computer. I myself have never considered particularly important the method used, but have always been fascinated by the given problem. The question whose answer I was seeking had to be interesting; but the method with which I sought the answer, whether it be the mechanical entering of data from questionnaires into the computer, or DNA-sequencing, or catching mice in the wild and observing whether more Toxo positive or Toxo negative individuals were caught in the mouse-trap, was not important to me. But it was important to some of my students, so I carried out at least part of the studies on animals, even though I was much more interested in the results obtained on humans. Fig. 19 The preference for the body odor of dominant men by engaged and not engaged women in different phases of their menstrual cycle. Preference for dominant men was expressed as the value of the correlation coefficient (r) between the dominance of the man based on a psychological questionnaire, and the average pleasantness of his body odor according to a given group of women. The graph demonstrates that all women preferred the odor of dominant men; however, the greatest preference was expressed by women in the fertile period of their menstrual cycle. Footnote: By backwards I only mean that they haven’t yet read my book, don’t search for any other meaning. It was explained to me that I must be politically correct in the English version of my book and avoid joking about certain topics. It’s something I’m well-trained in; I had to practice auto-censorship for half my life. It's interesting that women were able to sniff out the dominant males so well. The modern obsession with body hygiene and the use of deodorants may even be one of the causes of the high divorce rate. A number of studies show that, in seeking their partner, mammals (including humans) follow olfactory cues. When comparing, for example, the MHC proteins of couples, there are more differences between them then could be attributed to chance. At the same time it has been safely proven that the effectiveness of the immune system, and thus also the resistance against infectious diseases, depends primarily on the optimal heterogeneity of the MHC proteins of individuals (Box 34 Is sexual reproduction related to defense against parasites?). If through the use of deodorant we prevent that couples smell each other when getting together, we cannot be surprised that a large percent of them discover only after the wedding that the other person "stinks" (23). The main reason I had to constantly lead two teams occupying themselves with entirely disparate subjects was actually financial. As I already mentioned, in the case of the study of manipulation hypothesis it wasn’t possible to ask for that much money for projects, and there also wasn’t a good chance that the given project would be successful in the grant competition. In the typical grant competition in the Czech Republic, the researcher writes out a project and hopes that it will appeal to three anonymous reviewers, that they‘ll all evaluate it fairly positively, and thus that the given grant agency will be willing to finance him. The problem arises when the project has a controversial subject – which the study of manipulation hypothesis on the model of Toxoplasma-human most certainly is. Then, it is very likely that among the three reviewers at least one won’t like the project and, under whatever pretext, will reject it. There was nearly always at least one reviewer, evaluating my projects directed towards the study of the effect of toxoplasmosis on human behavior, who found the idea that a parasite could alter human behavior completely absurd (and maybe even offensive). Box 34 Is sexual reproduction related to defense against parasites? Yet I was able to gradually carry through a number of projects. Either I, or later my students, managed to get several grants from the internal Grant Agency of Charles University, and four from the Grant Agency of the Czech Republic. Nevertheless, I had to submit overall about 12 to 15 grant applications on this subject to just two grant agencies. Maybe this rate of success isn’t that much lower than the average at these grant agencies, but the fact remains that our molecular taxonomy projects were more successful. Still, the main problem lay in that the projects related to Toxoplasma brought the laboratory substantially less money than did projects in the field of molecular taxonomy, so it was difficult with the former to finance lab equipment and the pay the salaries of all the grads and undergrads. It was especially necessary to ensure pay for graduates in their fourth or higher year of study, when then no longer received a stipend. This funding could be easily obtained from the molecular taxonomy projects. For these purely practical reasons, I had continue to also lead a molecular taxonomy team; although I admit that when the studies on the effect of toxoplasmosis began clearly producing very interesting results, molecular taxonomy projects weren’t that exciting to me. Fortunately, I had a number of clever students who took charge of these projects and were able to achieve many interesting results. Our molecular taxonomy papers were published in top journals and abundantly cited; and, above all, many were written. That was another reason why I devoted a substantial chunk of my time to these projects, even though my heart was elsewhere. Scientific productivity is measured – and not just in my country – according to the number of published papers, as well as how often those papers are cited in the works of other authors. Namely the amount of published papers grew faster in projects studying molecular phylogenetics than in projects pertaining to the effect of toxoplasmosis on behavior. Our molecular taxonomy projects weren’t controversial, and we had the advantage that there were people in our department able to acquire the necessary protozoa from nature. In our case it was mainly Jaroslav Kulda, who not only brought us a vast amount of vital knowledge and experience, but also managed to pass on this knowledge to students; so after a while our team had many such people (Fig. 20). Fig. 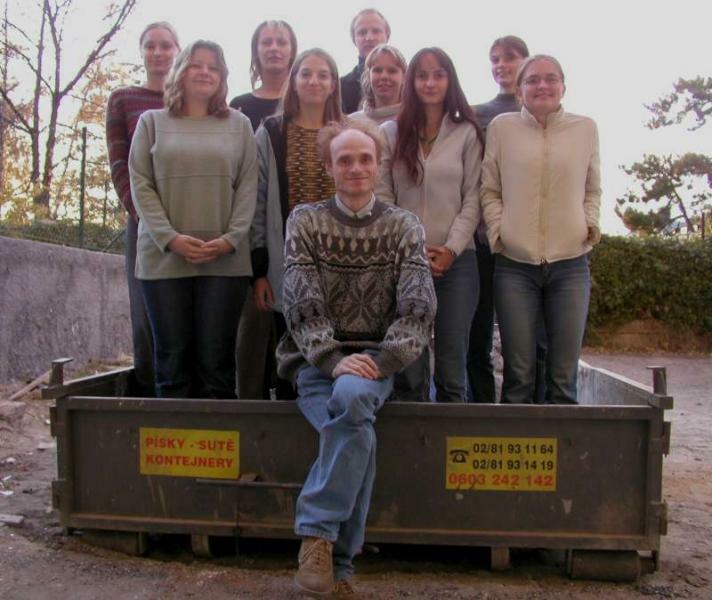 20 The team of molecular taxonomy, at the time of its strongest lineup (year 2005). From the left: Vladimír Hampl, Ivan Čepička, Magdaléna Uzlíková, Dušan Kolár, Martin Kostka, Martin Kolísko, Jaroslav Flegr. By these I mean my colleagues Vladimir Hampl and Ivan Čepička; Martin Kostka and Martin Kolísko were also very good. Plus we had at our disposal a unique collection of frozen isolates of parasitic protozoa. At the time a number of them had no known gene sequences, so often we only had to select a couple of interesting protozoa species, whose placement in the protozoological classification was unknown, and then fish around in the container of liquid nitrogen. We hit upon an opportune time, because the phylogenetic system of unicellular organisms was just being radically re-evaluated, so there was great interest in our results. So it wasn’t all that difficult to publish them. Whereas work pertaining to the effect of toxoplasmosis on behavior was mostly rejected by the editors of three to four journals, until it was finally accepted by the fifth; our molecular phylogenetic papers were usually accepted by the first, and at least by the second journal we sent it to. That was important to me, because thanks to the molecular phylogenetic publications our laboratory didn’t in any way performance-wise fall behind the other research teams in the department (and even less so in the university), so I could defend projects regarding toxoplasmosis, which brought publications much more slowly. And finally it must be said that the molecular taxonomy projects enabled me to achieve habilitation, to obtain the teaching position of associate professor and later even professor. While my inaugural professorial thesis was dedicated only to manipulation hypothesis, a large part of the publications and citations also evaluated by the promotion committees were actually related to molecular phylogenetics, and sometimes evolutionary biology, another field that I studied for a long time. I worked independently on evolutionary biology, sometimes cooperating with colleagues in different workplaces; but that’s another chapter, which I don’t wish to discuss too much in this book – perhaps just here and there in some box (such as Box 35 How I refuted Darwin). Darwin’s theory of evolution presumes that advantageous traits evolve in species as a result of the effect of natural selection. If stronger individuals are more likely than weaker individuals to survive to maturity and reproduce, then the average strength of the member of a species should increase each generation. For with each individual there are always mutations, some increasing and others decreasing the fitness (viability and fertility) of their bearer. Individuals bearing mutations which raise their fitness are more likely to reproduce than individuals without such mutations, and even more so than individuals with mutations that lower their fitness (this is the majority of mutations). Because mutations are passed down from parent to offspring, the fraction of individuals with advantageous mutations should steadily grow, and the average fitness of the member of a population should thereby increase each generation. The vast majority of biologists sees Darwin’s theory of evolution as entirely satisfying and doesn’t believe it necessary to change anything about it. But in reality this theory can explain evolution only for asexually reproducing organisms (such as bacteria or plants reproducing vegetatively, through tubers or rhizomes). In sexually reproducing organisms mutations can also be passed down from the parents to the offspring, but because the genes of both parents are mixed to form the genotypes of the offspring, then in each generation the same mutation occurs in the presence of different genes, changing its effect on the traits of the organism. A mutation (or, rather, a gene variant – allele) which raised fitness in one parent may, with a combination of genes with the other parent, actually lower the fitness of the offspring (or raise the offspring’s viability, but lower its fertility). In asexually reproducing organisms, the parents’ gene combination passes down to the offspring unchanged (at most enriched by some new mutation), so the parents’ traits are inherited by the offspring of the next generation. Unlike this, in sexually reproducing species new combinations of alleles arise in each generation, mixed from alleles of both parents. As a result of this, the parents’ traits are not inherited and the classical Darwinian mechanism of evolution cannot work here. This corresponds with the findings of modern paleontology, a science studying fossils. Paleontologists have shown that species change very little over the span of their existence, and when their time has comes to die out, they often look entirely the same as they did when they were formed. Of course, here and there an old species branches off a new one, which from the start is distinct from the ancestor species. If Darwin’s theory were also applicable to sexually reproducing species, the paleontological picture would be very different – above all in that species would have the capacity to change at any time during their existence, not just in the beginning. To explain how evolution can work in sexually reproducing organisms (which, by the way, is the vast majority of known species present on Earth), and simultaneously to define the picture of the species evolution provided to us by modern paleontology, sometime in the later 90s I created the frozen plasticity theory (24) (10). According to this theory, sexually reproducing species really cannot evolve through the effects of natural selection, firstly because their traits are not inherited (see the above), and secondly because the advantage or disadvantage of individual gene variants often depends on their numeric representation in the population. So species don’t act plastically (as Darwin imagined), but elastically – at first they happily react to natural selection, but as the numeric representation of individual alleles grows further from average, the individuals respond less to natural selection, until they finally stop reacting entirely. When natural selection is interrupted, the numeric representation of individual alleles (and thus also the average traits of the member of that species).returns to previous levels. But under certain conditions the species can switch over from an elastic to a plastic state, and, through the effect of natural selection, began evolving just as Darwin imagined. This happens, for example, when a small number of species members colonize an island far from the continent, where their offspring survive many generations as a small colony. During this time, chance (biologists call this genetic drift) erases almost all the alleles – from each gene there ideally remains but one. When the population increases sufficiently, there arise ideal conditions for Darwinian evolution. The population is large, so the fate of an individual is determined by natural selection, instead of chance, like in small populations. But at the same time, the individuals are genetically similar; therefore the mutations in each generation will occur in the presence of the same alleles – despite the fact that each individual gets new gene combinations mixed from two parents. Because both parents have nearly identical gene combinations (aside from maybe a few mutations), their genes can combine in whichever way but always achieve the same result. Therefore a species re-establishes evolutionary plasticity and can begin evolving. Yet over time the new species accumulates more and more alleles, often because the benefit of these alleles decreases as they spread throughout the population. The fate of such variants is determined by the so-called negative frequency dependent selection. So long as alleles remain rare after they’re formed, they are advantageous and spread throughout the population through natural selection; but when they become abundant, their merit decreases. Due to their frequency dependence, they can never become prevalent nor entirely disappear from the population (see Box 70 Genetic polymorphism: what it is, where it comes from, and how it’s maintained in nature?). A new species loses its plasticity and becomes more and more elastic. Paleontological data shows that a species persists in a plastic state only about 20 thousand years (less than one percent of the usual length of a species’ existence), which is a fairly long time for it to substantially change from its ancestor species, but also a short enough period of time in paleontological record that the formation of the new species looks like a sudden jump. The frozen plasticity theory further presumes that over time different evolutionary branches accumulate characters, which could become plastic only with great difficulty even during the formation of a new species. The accumulation of these eternally frozen characters is thanks to the process of sorting on the basis of stability (what is unstable come and goes, and what is stable remains). This accumulation of eternally frozen characters may explain why the rate of evolution over the course of Earth’s history has been slowing, and why the greatest evolutionary innovations in animals were formed over a relatively short period of time (possibly about ten million years), half a billion years ago (in the Cambrium) – and why, since that time, no drastically different body plans have appeared (25). That I was capable of turning out a sufficient number of publications additionally increased the chance that I’d gain grant resources for projects regarding Toxoplasma. When one requests a grant, he also presents a list of his past publications (at some grant agencies only those from the last five years). The reviewers don’t usually peruse the topics of these publications, but observe their number, and how prestigious the journals. When I had a sufficient number of papers, there was a decidedly greater chance that I’d obtain a new grant, even one for a completely different project – related, perhaps, to toxoplasmosis. So that I could successfully pursue myself to the study of toxoplasmosis, I had to dedicate my time and energy to other projects, which, as I already admitted, were not as dear to me. Although to be honest, I exaggerate a bit. I enjoyed molecular biology projects too. Probably I was one of the first in our country to start seriously studying the topic, and in the time when molecular phylogenetics was just developing as a scientific field. Only at the end of the 90s was it definitely established, and at that moment the subject lost a great deal of its magic for me. I wonder what problems I would have pursued in the new century had I not hit upon the effect of toxoplasmosis on human behavior. I expect that it would not have been molecular phylogenetics anyway. Rather, I’d bet on genomics, particularly in relation with immunology – most likely I’d be testing my hypotheses concerning the adaptation of the peptide repertoires of parasites to the peptide repertoires of hosts (see Box 36 On peptides, and why they should interest a parasitologist). Proteins are generally considered the most interesting and varied molecules in modern cells. (Time will probably show that RNA molecules are even more interesting and varied, but so far not much is known about them.) Proteins make up the definite majority of enzymes, regulatory and signaling molecules, molecular motor and pumps, as well as a large part of cells’ molecular building-blocks. They therefore are the main component of a modern organism’s “hardware.” A protein molecule is chemically formed by a linear chain, in which twenty kinds of amino acids alternate in an apparently random pattern. The order of the twenty amino acids (relatively small organic molecules, which have in common only the fact that on one end they have a carboxyl and on the other an amino group, allowing them to unite using peptide bonds into a linear chain) is determined by the respective genes. This order decides the shape the chain will fold into, and thus what function it will perform. Yet the same shape and thereby similar function can be attained with different, though generally similar, amino acid sequences. Proteins are the main molecules used by the immune system to recognize the presence of parasites, whether they be viruses, bacteria or even Toxoplasma. A certain amount of each protein synthesized in the cell (intracellular) or brought in from the outside (extracellular), is cleaved using special enzymes into small pieces about 7-14 amino acids long. These peptides are, by the means of MHC proteins (MHC antigens), transported to the cell surface and there presented. Peptides from intracellular proteins are bound to and presented on MHC class I proteins; peptides from extracellular proteins, on MHC class II proteins. All cell surfaces are continuously examined by a type of white blood cell called T-cells (or T-lymphocytes). Each T-cell has on its surface a receptor with which it is able to recognize a certain peptide. In the body there are many groups of T-cells clones, with different receptors and thus recognizing different peptides. Unless an organism suffers from an autoimmune disease, it has only T-cells that recognize “non-self” peptides, peptides not present in the proteins synthesized by its own body. The body does produce T-cells that recognize any type of peptide, but all “immature” T-cells, which recognize a “self” protein, commit cell-suicide (apoptosis) while passing through the thymus. There are many types of T-cells; at this moment we are interested in cytotoxic and helper T-cells. Cytotoxic T-cells, or “killer” T-cells, recognize only peptides presented on class I MHC-proteins, peptides which come from intracellular proteins. True to their name, cytotoxic T-cells kill the unhappy cell presenting the foreign peptide – since the presence of a peptide that a cytotoxic T-cell can recognize signifies that “non-self” proteins, which most likely come from a parasite like Toxoplasma or a virus, are being synthesized in the presenting cell. Helper T-cells recognize peptides presented on class II MHC-proteins, peptides from proteins brought into the cell. While class I MHC-proteins occur on almost all types of cells, class II MHC-proteins are present only on certain cell types defending against parasites, such as B-cells or macrophages. (Dear reader, I simplify greatly, but believe me when I say it is for your sake). If a helper T-cell recognizes the presence of “its” foreign peptide on a cell, then it’s proof to the helper T-cell that the cell presenting the peptide is capable of ingesting a foreign intruder or proteins from a foreign intruder. The helper T-cell provides such a cell with growth factor (see also Box 22 Antibodies and myths about them). It would be particularly advantageous for a parasite to succeed in removing from its proteins (gradually by evolution, through mutations in the respective genes) all the peptides not present in the proteins of its host. If the parasite could adapt its own peptide repertoire to that of its host, then the host’s immune system could not detect it. Similarly, it would be advantageous for the parasite to cut down its peptide repertoire as much as possible, getting rid of all the peptides it can afford to. This would eliminate of a large part of the target the T-cells in the host body use to recognize an invader, so the parasite could target a wider range of host species. It would likewise be advantageous for the host organism to cut down on its own expendable peptides, for then it could recognize a greater number of peptides as foreign. But all this is only a theory – my theory, to be perfectly clear. Seemingly, it shouldn’t be difficult to prove it. Potential hosts like mammals and birds, with an immune system based on the presentation of peptides, should have a sparser peptide library than potential hosts without such an immune system – hosts such as plants and free-living protozoa. Parasites should have a sparser peptide repertoire than their non-parasitic relatives; a specialized parasite, targeting but one host species, should have a similar peptide repertoire (containing the same peptides) as its host. Hybrids of two host species should have a richer peptide repertoire than both the parent species and should also be more susceptible to parasites (this has actually been confirmed). But surprisingly enough, over time it became clear that proving or disproving the existence of these (and other) phenomena stemming from my theory was extremely difficult. I threw in the towel over 20 years ago, followed ten years ago by my undergraduate and later graduate student Pavel Cindr. Five years ago not even my colleague Martin Mokrejš got very far, and currently my graduate student Michaela Zemková continues to wrestle with the problem. It seems there’s nothing to do but cross our fingers and hope. Most biologically significant molecules, including proteins, carry both positive and negative charges on their surface; we call them amphiphatic molecules. In an environment with a high pH (a basic environment) where there are few free protons, positively charged protons loosen from the amphiphatic molecules and the molecules’ net charge become more and more negative. But in an environment with a low pH (an acidic environment), where there are many free protons, there these positively charged particles bind to amphiphatic macromolecules, whose net charge thus becomes positive. In an electric field, positively charged molecules move towards a negative electrode, while negatively charged molecules towards a positive electrode – a process called electrophoresis. If the electrophoresis of proteins or other molecules carrying both a positive and negative charge occurs in an environment with an existing pH gradient (in which the pH gets higher approaching a positive electrode and lower approaching a negative electrode), then proteins move towards a positive or negative electrode, depending upon their surface charge. When molecules with a positive initial charge reach an area of high pH, they gradually loose protons, and thus also their net positive charge. For this reason, in a certain area of the pH gradient, their movement stops. The same is true for molecules with a negative initial charge. At first they move towards a positive electrode, approaching an area of low pH, gaining more and more protons, and so gradually losing their negative charge – until they lose it entirely and their movement in the electric field comes to a complete stop. Each amphiphatic molecule (and thus every protein) has a pH at which its net charge and movement in an electric field are zero. We call this pH the isoelectric point and abbreviate it as pI. If we form an electric field in an environment with a pH gradient, then the proteins concentrate (focus) in certain locations based on their pI, separating different proteins from each other. When we have many types of ampholytes, with different isoelectric points, in solution, we don’t have to create a pI gradient ahead of time – it will form in the solution on its own due to the voltage between the electrodes. Biochemists use isoelectric focusing to separate complicated mixtures of proteins occurring in the cell; as well as to isolate a protein they’re interested in, or at least to detect its presence. In the year 1990, I published in the journal Biosystems the hypothesis that isoelectric focusing is also carried out by a living cell (26). I calculated that only a fraction of the energy the cell has at its disposal is needed for the cell to focus its macromolecules into different areas of its interior, accelerating and streamlining its metabolic processes. In the year 2009 I published in the Journal of Molecular Evolution an article in which I showed that evolutionary „invention“ of intracellular focusing could have prompted the origin of the eukaryotic cell – it could have made possible the existence of cells with a volume ten thousand times greater than that of typical prokaryotic cells (the cells of bacteria and archea) (27). In a small prokaryotic cell molecular transport can by managed by diffusion; but molecular transport spanning a large cell would take dozens of minutes by diffusion, which would intolerably lower the rate of all metabolic processes in the cell. So that cells could get bigger, they had to invent alternative mechanisms to transport molecules, and one of these mechanisms could have been intracellular isoelectric focusing. Incidentally, isoelectric focusing can explain even the usual way intracellular processes are regulated. When a cell is to switch on or off a certain chemical process, such as a metabolic pathway (perhaps a sequence of reactions leading to the synthesis of carbohydrates), it often phosphorylates or dephosphorylates a key enzyme of the metabolic pathway (by binding a negatively charged phosphate group to the enzyme, or removing it). This necessarily changes the enzyme’s isoelectric point, and results in the enzyme moving to a different part of the cell, somewhere the metabolic process can (or can’t) be carried out. Additionally, enzymes of individual metabolic pathways can be concentrated through isoelectric focusing into certain parts of the cell, so that the respective metabolic processes can proceed simultaneously and yet independently.